We went camping last weekend. This was our second attempt; the first one last Autumn was a disaster. Nachito would not stay inside the sleep-bag during the night and he was going to get a cold outside, so at 1:00 am I had to pack everything and head back to arrive home three hours later. This time Nachito is almost one year older and his mom came with us, so we had more chances to success, and in fact, it went pretty well; Nachito behaved like a grown up this time. 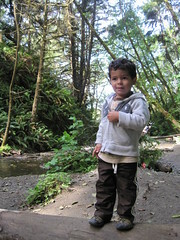 We stayed at the Mill Creek campground in Del Norte Park. 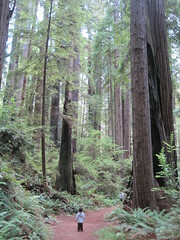 All the campsites are surrounded by lush vegetation and covered by the canopy of giant redwoods. The weather outside was nice, but the Mill Creek valley was always humid, it rained during the nights, and in the mornings the mist rose and shafts of light came through the trees. 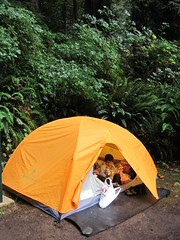 We got a secluded site and after setting up the tent it quickly felt like home. On the first day we went to Prairie Creek and did a section of the James Irvine and Miner’s ridge trail. We started the trail in Fern Canyon and took the Clintonia trail shortcut to reduce the length down to 7 miles. Fern Canyon was pretty nice, but too crowded to my taste. On the other side Nachito had a great time hiking along the other kids, looking for fishes and snakes, and throwing rocks to the water. The rest of the trail was nice redwood forest, although I think we missed the best part, which is at the beginning of the James Irving trail. 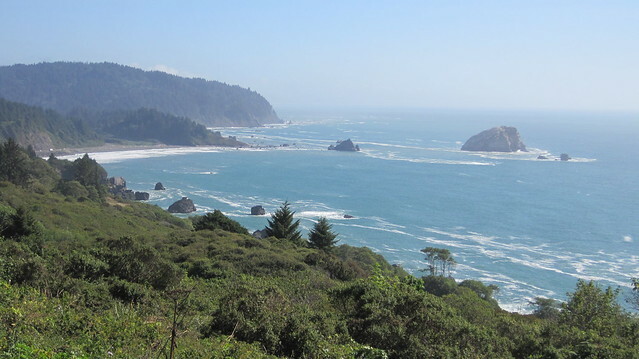 After leaving the Fern Canyon the crowds dispersed. We met a few groups during the first few miles, but after entering the Clintonia trail we were left alone during the rest of the day. Sometimes the vegetation was so lush and so high that the trail became a narrow tunnel under it, sometimes it opened up and we could see the beauty of the redwood forest in all directions. Nachito behaved like a champ hiking 6 out the 7 miles. In order to achieve that we had to make frequent stops, or take him in our arms, back and shoulders from time to time. We had to constantly find games to keep him excited. Sometimes there were snakes pursuing us, or swiper the fox was waylaying us. He loves crossing bridges, so we would constantly look forward to the next one, and we counted the number of steps steps in all the stairs along the trail. Every once in a while I would give him a peanut to keep him walking, and on every important milestone he would get a piece of chocolate. At the end of the day he was so exhausted that when we arrived to the beach Mariana and Nachito decided to stay there waiting for me to finish the trail and get the car. The day was gorgeous and outside the cover of the forest, the sun shined brightly. We were hoping we could take a quick bath, Nachito didn’t wait much to get naked, but unfortunately the water was too cold and the sea too rough. 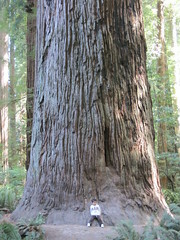 The next day we were planning to do The Boy Scout Tree Trail at the Jedediah State Park before heading back home, but Nachito was too tired for that, and instead we simply wandered around the magnificent redwoods trees at the ancient looking Stout Grove that, despite its small size, is probably one of the most beautiful redwood forests that I’ve ever seen. We then spent the rest of the day laying under the sun on the quiet shores of the Mill Creek unaware that the Grove of Titans was just a few steps away from us.